I talk a lot on this blog about the human brain, and what various parts are responsible for in terms of behavior and sensation/perception. But I don't really delve much into other body parts. 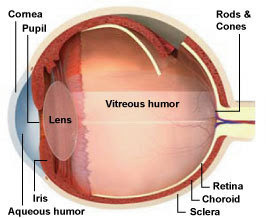 However, I learned Monday about a third set of receptors in the eye that I started looking into. Circadian rhythms - They help to regulate our day/night cycles, by sending signals to the hypothalamus. Our bodies use light to regulate when we should be awake and when we should be asleep. Melatonin regulation - Relatedly, they contribute to our body's regulation of melatonin, which also relates to metabolism and sleep-wake cycles. Pupil response - They also play a role in our pupil response to light. These cells are why people who are blind may still show a pupil response to light and dark. These receptors help explain why people who are blind can experience sleep disturbance. If these receptors aren't functioning properly, a person's sleep-wake cycle could be affected. Intrinsically photosensitive retinal ganglion cells were accidentally discovered in the 1920s, when geneticist Clyde E. Keeler bred mice without rods and cones (yes, they were in fact blind mice), but found they still responded to light. However, no one did anything in this line of research until the 1990s, and these specific cells weren't discovered until the early 2000s. These cells respond mostly to blue light. It's probably no coincidence, then, that light therapy to treat sleep disturbance (as well as seasonal affect disorder) often uses blue light.